Cycle between autotrophs and heterotrophs. Autotrophs use light, carbon dioxide (CO2), and water to form oxygen and complex organic compounds, mainly through the process of photosynthesis (green arrow). Both types of organisms use such compounds via cellular respiration to both generate ATP and again form CO2 and water (two red arrows). A heterotroph (/ˈhɛtərəˌtroʊf, -ˌtrɒf/; Ancient Greek ἕτερος héteros = "other" plus trophe = "nutrition") is an organism that cannot produce its own food, relying instead on the intake of nutrition from other sources of organic carbon, mainly plant or animal matter. In the food chain, heterotrophs are primary, secondary and tertiary consumers, but not producers. Living organisms that are heterotrophic include all animals and fungi and some bacteria and protists. The term heterotroph arose in microbiology in 1946 as part of a classification of microorganisms based on their type of nutrition. The term is now used in many fields, such as ecology in describing the food chain. Heterotrophs may be subdivided according to their energy source. 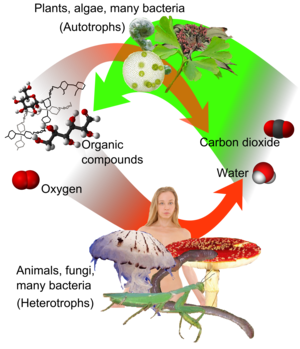 If the heterotroph uses chemical energy, it is a chemoheterotroph (e.g., humans and mushrooms). If it uses light for energy, then it is a photoheterotroph (e.g., green non-sulfur bacteria). Heterotrophs represent one of the two mechanisms of nutrition (trophic levels), the other being autotrophs (auto = self, troph = nutrition). Autotrophs use energy from sunlight (photoautotrophs) or inorganic compounds (lithoautotrophs) to convert inorganic carbon dioxide to organic carbon compounds and energy to sustain their life. Comparing the two in basic terms, heterotrophs (such as animals) eat either autotrophs (such as plants) or other heterotrophs, or both. Detritivores are heterotrophs which obtain nutrients by consuming detritus (decomposing plant and animal parts as well as feces). Saprotrophs (also called lysotrophs) are chemoheterotrophs that use extracellular digestion in processing decayed organic matter. It is a term most often associated with fungi. The process is most often facilitated through the active transport of such materials through endocytosis within the internal mycelium and its constituent hyphae. Heterotrophs can be organotrophs or lithotrophs. Organotrophs exploit reduced carbon compounds as electron sources, like carbohydrates, fats, and proteins from plants and animals. On the other hand, lithotrophs use inorganic compounds, such as ammonium, nitrite, and sulfur to obtain electron sources. 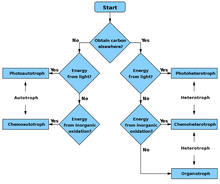 Another way of classifying different heterotrophs is by assigning them as chemotrophs or phototrophs. Phototrophs utilize light to obtain energy and carry out metabolic processes, whereas chemotrophs use the energy obtained by the oxidation of chemicals from their environment. Photoorganoheterotrophs, such as Rhodospirillaceae and purple non-sulfur bacteria synthesize organic compounds using sunlight coupled with oxidation of organic substances, including hydrogen sulfide, elemental sulfur, thiosulfate, and molecular hydrogen. They use organic compounds to build structures. They do not fix carbon dioxide and apparently do not have the Calvin cycle. Chemolithoheterotrophs like the Oceanithermus profundus obtain energy from the oxidation of inorganic compounds. Mixotrophs (or facultative chemolithotroph) can use either carbon dioxide or organic carbon as the carbon source, meaning that mixotrophs have the ability to use both heterotrophic methods as well as autotrophic methods. Although mixotrophs have the ability to grow both under both heterotrophic and autotrophic conditions, C. vulgaris have higher biomass and lipid productivity when growing under heterotrophic conditions compared to autotrophic conditions. Heterotrophs, by consuming reduced carbon compounds, are able to use all the energy that they obtain from food for growth and reproduction, unlike autotrophs, which must use some of their energy for carbon fixation. Both heterotrophs and autotrophs alike are usually dependent on the metabolic activities of other organisms for nutrients other than carbon, including nitrogen, phosphorus, and sulfur, and can die from lack of food that supplies these nutrients. This applies not only to animals and fungi but also to bacteria. Many heterotrophs are chemoorganoheterotrophs that use organic carbon (e.g. glucose) as their carbon source, and organic chemicals (e.g. carbohydrates, lipids, proteins) as their energy and electron sources. Heterotrophs function as consumers in food chain: they obtain these nutrients from saprotrophic, parasitic, or holozoic nutrients. They break down complex organic compounds (e.g., carbohydrates, fats, and proteins) produced by autotrophs into simpler compounds (e.g., carbohydrates into glucose, fats into fatty acids and glycerol, and proteins into amino acids). They release energy by oxidizing carbon and hydrogen atoms present in carbohydrates, lipids, and proteins to carbon dioxide and water, respectively. They can catabolize organic compounds by respiration, fermentation, or both. Fermenting heterotrophs are either facultative or obligate anaerobes that carry out fermentation in low oxygen environments, in which the production of ATP is commonly coupled with substrate-level phosphorylation and the production of end products (e.g. alcohol, CO2, sulfide). These products can then serve as the substrates for other bacteria in the anaerobic digest, and be converted into CO2 and CH4, which is an important step for the carbon cycle for removing organic fermentation products from anaerobic environments. Heterotrophs can undergo respiration, in which ATP production is coupled with oxidative phosphorylation. This leads to the release of oxidized carbon wastes such as CO2 and reduced wastes like H2O, H2S, or N2O into the atmosphere. Heterotrophic microbes’ respiration and fermentation account for a large portion of the release of CO2 into the atmosphere, making it available for autotrophs as a source of nutrient and plants as a cellulose synthesis substrate. Respiration in heterotrophs is often accompanied by mineralization, the process of converting organic compounds to inorganic forms. When the organic nutrient source taken in by the heterotroph contains essential elements such as N, S, P in addition to C, H, and O, they are often removed first to proceed with the oxidation of organic nutrient and production of ATP via respiration. S and N in organic carbon source are transformed into H2S and NH4+ through desulfurylation and deamination, respectively. Heterotrophs also allow for dephosphorylation as part of decomposition. The conversion of N and S from organic form to inorganic form is a critical part of the nitrogen and sulfur cycle. H2S formed from desulfurylation is further oxidized by lithotrophs and phototrophs while NH4+ formed from deamination is further oxidized by lithotrophs to the forms available to plants. Heterotrophs’ ability to mineralize essential elements is critical to plant survival. Most opisthokonts and prokaryotes are heterotrophic; in particular, all animals and fungi are heterotrophs. Some animals, such as corals, form symbiotic relationships with autotrophs and obtain organic carbon in this way. Furthermore, some parasitic plants have also turned fully or partially heterotrophic, while carnivorous plants consume animals to augment their nitrogen supply while remaining autotrophic. Animals are classified as heterotrophs by ingestion, fungi are classified as heterotrophs by absorption. ^ "Heterotroph Definition". Biology Dictionary. 15 December 2016. ^ Hogg, Stuart (2013). Essential Microbiology (2nd ed.). Wiley-Blackwell. p. 86. ISBN 978-1-119-97890-9. ^ a b "How Cells Harvest Energy". McGraw-Hill Higher Education. ^ Lwoff, A., C.B. van Niel, P.J. Ryan, and E.L. Tatum (1946). Nomenclature of nutritional types of microorganisms. Cold Spring Harbor Symposia on Quantitative Biology (5th edn. ), Vol. XI, The Biological Laboratory, Cold Spring Harbor, N.Y., pp. 302–303, . ^ Wetzel, R. G. 2001. Limnology: Lake and River Ecosystems. Academic Press. 3rd. p.700. ^ Advanced biology principles, p 296—states the purpose of saprotrophs and their internal nutrition, as well as the main two types of fungi that are most often referred to, as well as describes, visually, the process of saprotrophic nutrition through a diagram of hyphae, referring to the Rhizobium on damp, stale whole-meal bread or rotting fruit. ^ Mills, A.L. (1997). The Environmental Geochemistry of Mineral Deposits: Part A: Processes, Techniques, and Health Issues Part B: Case Studies and Research Topics (PDF). Society of Economic Geologists. pp. 125–132. ISBN 978-1-62949-013-7. Retrieved 9 October 2017. ^ a b c Mauseth, James D. (2008). Botany: an introduction to plant biology (4th ed.). Jones & Bartlett Publishers. p. 252. ISBN 978-0-7637-5345-0. ^ Libes, Susan M. (2009). Introduction to marine biogeochemistry (2nd ed.). Academic Press. p. 192. ISBN 978-0-12-088530-5. ^ Dworkin, Martin (2006). The prokaryotes: ecophysiology and biochemistry (3rd ed.). Springer. p. 988. ISBN 978-0-387-25492-0. ^ Liang, Yanna (July 2009). "Biomass and lipid productivities of Chlorella vulgaris under autotrophic, heterotrophic and mixotrophic growth conditions". Biotechnology Letters. 31 (7): 1043–1049. doi:10.1007/s10529-009-9975-7. PMID 19322523. ^ Campbell and Reece (2002). Biology (7th ed.). Benjamin-Cummings Publishing Co. ISBN 978-0805371710. ^ Mills, A.L. "The role of bacteria in environmental geochemistry" (PDF). Retrieved 19 November 2017. ^ "Heterotrophic nutrition and control of bacterial density" (PDF). Retrieved 19 November 2017. ^ a b c Gottschalk, Gerhard (2012). Bacterial Metabolism. Springer Series in Microbiology (2 ed.). Springer. doi:10.1007/978-1-4612-1072-6. ISBN 978-0387961538. ^ a b c d e f Wade, Bingle (2016). MICB 201: Introductory Environmental Microbiology. pp. 236–250. ^ a b c d e Kirchman, David L. (2014). Processes in Microbial Ecology. OUP Oxford. pp. 79–98. ISBN 9780199586936. This page was last edited on 24 April 2019, at 11:23 (UTC).